Are there any old furniture you no longer need and would like to have them thrown away? Has your fridge or oven broken down and you want it out of the house before you get the new one delivered? Whatever household objects and appliances you need removed, we offer exceptional house clearance in London for your convenience! Rest assured we will provide you with the highest quality service, at day and time of your choice and within you budget. Booking our household rubbish collection guarantees you will enjoy a service of the highest quality. In addition, when becoming our customer, you will enjoy the following, and many more, benefits. 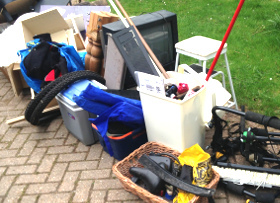 On top of it all, our house clearance service just like every other of our services is available at a reasonable price. What Do Our House Clearance Services Include? Want to Know a Bit More About The Team? We are proud to say that the team includes some of the best home waste removals experts in the area. We are very careful when hiring new professionals and perform a full background check to each and every one of them. And once a removalist joins our company, we have him trained to safely handling and disposing of house waste of different size and type. What else makes us stand out? Schedule House Clearance in London Now! Dial 020 3404 4868 now for comprehensive house clearance in London! One of our customer advisers will give you a free, no-obligation quote over the phone, and will help you book your household waste collection service. We will provide you with an exact price quote onsite and once you agree with the price, we will have everything loaded onto our vans and disposed of at the right dumping grounds. And for those of your that prefer to get in-touch online. Fill in our contact form to request a call back at suitable time.